When I moved to college, one of the first gadgets I had to buy was a blender. Same thing when I moved to Paris. Growing up, every morning started off with the sound of fruit and yogurt whirling in the kitchen. I probably had a smoothie nearly every day or so- right up until I moved to France. Never did I have a hot drink for breakfast; tea, in my opinion, was reserved for evening and I didn’t know how to drink coffee. Since we’re all products of our environment, my breakfast habits have little-by-little been influenced by those of the French. The typical petit déjeuner in France includes a hot drink (coffee or tea, but usually coffee) and some bread or biscottes (little dry, crunchy breads that we have yet to find in the United States) smeared with creamy butter and/or jam. On the weekends, breakfast branches out to fresh-baked goodies from the boulangerie. This straightforward routine, obviously, was an easy trap to fall into- especially since I’ve discovered the foam function on the coffee machine. Now, without a comforting hot drink, I just don’t feel like my day is starting out right. That’s until the first hot days of summer arrive. Then, all I want is an ice-cold smoothie. Just for info, the temperature in Paris today was a very warm 29 degrees C (84 degrees F). My newest obsession is kefir in my smoothies. 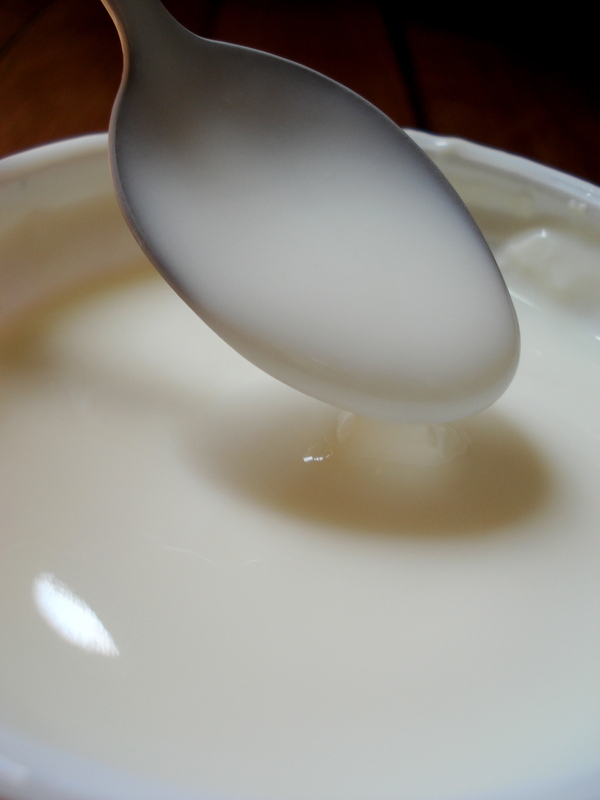 This is a slightly tart, fermented milk- thicker than drinking milk, but thinner than yogurt. It’s made from milk (cow, goat…) and “kefir grains”- a bacteria and yeast culture. Originally from the Caucasus, kefir is known to be quite good for you, especially for your digestive system- thanks to the presences of probiotic bacteria. Best of all, it’s delicious in a smoothie. My other smoothie obsession is bananas. All smoothies must have them. Trick: when your uneaten bananas start getting too ripe throw them in the freezer (just as they are) and keep them until you make a smoothie. To peel, run under hot water until you can easily take off the skin. I’d recommend putting a strainer at the bottom of the sink to keep the gooey peel from going down the drain.